Our March drill was an instructional class on the tricks of the trade, taught by FDNY LT Mike Ciampo. 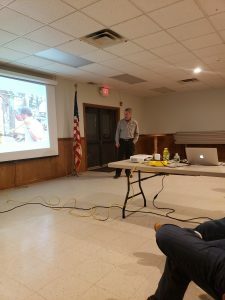 Mike gave the group of firefighters useful hints that he has learned from his years of experience as a volunteer firefighter in the Wyckoff FD and as a career firefighter, first in Washington, DC before eventually transferring to the FDNY. Mike is currently a Lieutenant assigned to Ladder 45 in the Bronx. 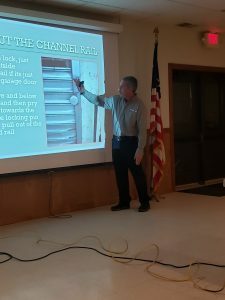 Mike goes all around the country teaching and providing training for firefighters. 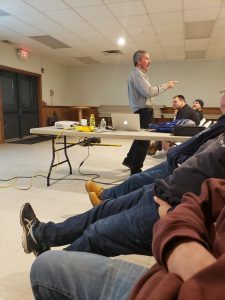 Joining us tonight to hear Mike speak, were members of the Allamuchy FD, Andover Borough FD, Andover Township FD, Byram FD, and Fredon FD.